The 8-mile-long The Dalles - Celilo Canal, located three miles north of The Dalles, was completed in 1915, creating a steamboat waterway around the Fivemile Rapids ("Long Narrows"), Tenmile Rapids ("Short Narrows"), and Celilo Falls. Combined with the Cascade Locks near Bonneville, it provided a clear journey from the Pacific Ocean to Lewiston, Idaho, a distance of 500 miles. The Celilo canal was 8.5 miles long, 65 feet wide, and eight feet deep at low water. There were five locks which were 45 feet wide and 300 feet long. The upper end of the canal was just above Celilo Falls and the lower end was just below Big Eddy, three miles above The Dalles. The canal had a drop of 81 feet in the Columbia River. After fifteen years of construction, the first steamers went through the lock on April 28, 1915. 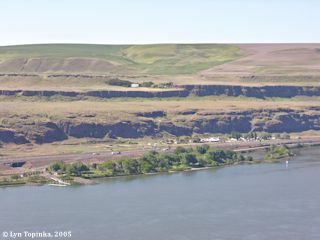 "The Dalles-Celilo Canal, 8.6 statute miles long, has its lower end 3.3 statute miles above The Dalles. There are 5 locks in the canal with a depth of 7 feet over the lower sill; the useable dimensions of the locks are 265 feet long and 45 feet wide. This canal is drowned out when the state at the upper pool exceeds 18 feet. There is a turning basin, 220 feet wide, in the canal near its lower end. There are two warehouses on the canal with a combined capacity of 15,000 tons of wheat." Source: The 1942 United States Coast Pilot, Pacific Coast, Serial No.649. On April 28, 1915, the first steamers went through the locks. They were the "Inland Empire", heading east to west, and the "J.N. Teal", heading west to east. The formal dedication of The Dalles-Celilo Canal was held at Big Eddy, the downstream end of the canal, on the afternoon of May 5, 1915. In 1957 the opening of The Dalles Dam and Locks flooded the locks and canal at Celilo, ending its history. 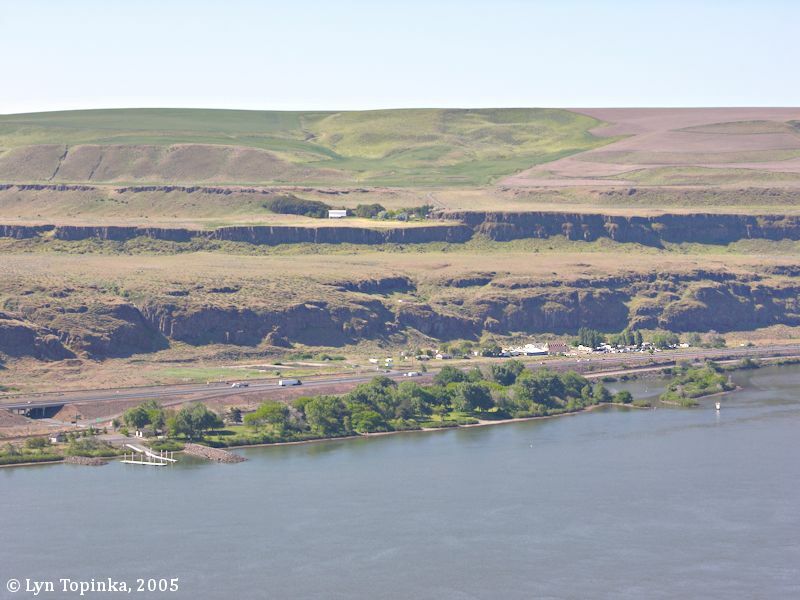 Today, Celilo Park is located at what was once the upper end of the The Dalles-Celilo Canal. Honor Accorded Inland Empire and J.N. Teal. Source: "Morning Oregonian", April 29, 1915, courtesy Historic Oregon Newspapers Archives, University of Oregon Libraries, 2016. The completion and opening of the canal were celebrated by communities of Washington, Oregon and Idaho during the week of May 3-8, 1915. The Canal is nearly nine miles long, is lcoated on the Oregon shore of the Columbia near the city of The Dalles and circumvents from east to west, Celilo or Tumwater Falls, Ten-Mile Rapids, and Five-Mile Rapids or The Dalles. A total fall of about eighty feet is overcome. The Canal has been under construction since 1905 and its cost (including the open river improvement of Three-Mile Rapids, just west of the lower end of the canal) has been about $4,800,000. Incident to the week of celebration was the first continuous trip to be made by a steamer from Portland to Lewiston, Idaho, and return. The Steamer Undine left Portland on the night of April 29, having been chartered by the Portland Chamber of Commerce, and bearing about 100 excursionists. This vessel arrived safely at Lewiston on the morning of May 3 where the first of the series of celebration programs was held, characterized by pageantry and rejoicing, attracting a large attendance, including the governors of Oregon, Idaho and Washington, a number of United States senators and representatives. The formal dedication of The Dalles-Celilo Canal occurred at a point on the canal known as Big Eddy on the afternoon of May 5. Hon. Joseph N. Teal, chairman of the Oregon Conservation Commission, and a leader in the public movement for the building of the canal, presided. Nearly all craft in the Portland Harbor joined in the celebration at the metropolis of Oregon which followed an early morning program at Vancouver, Washington. The Steamer Georgiana was made the flag ship of the celebration fleet, succeeding the Undine, on the remainder of the run from Portland to Astoria and the sea was reached aboard the Government light house tender, Manzanita, thus making it possible for participants to say that they had completed the first uninterrupted journey from tide water to the Inland Empire of Oregon, Washington and Idaho. Source: Marshall N. Dana, 1915, "Celebration of the Open Columbia", IN: The Quarterly of the Oregon Historical Society, vol.XVI, no.2, June 1915. Source: "The Sunday Oregonian", May 9, 1915, courtesy Historic Oregon Newspapers Archives, University of Oregon Libraries, 2016. 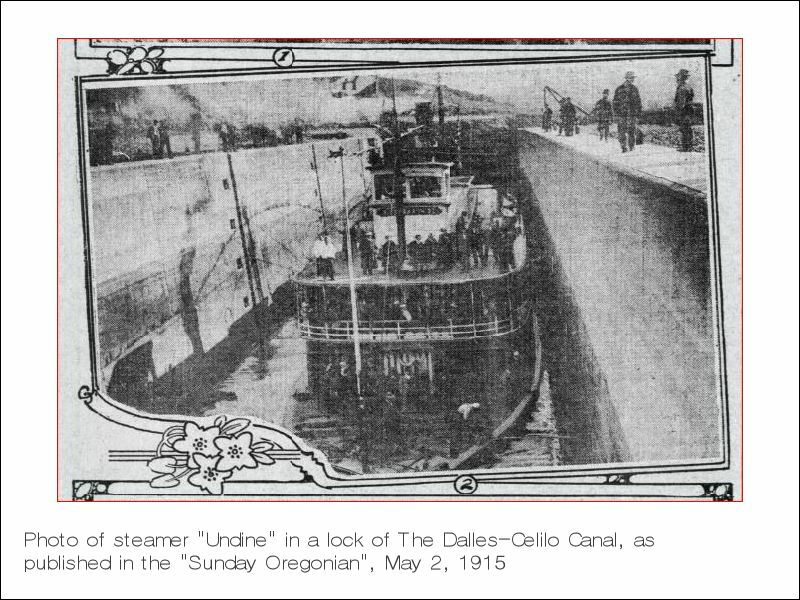 Click image to enlarge Photo, Steamer "Undine" going through a lock of The Dalles-Celilo Canal, as published in the "Sunday Oregonian", May 2, 1915. Original courtesy Historic Oregon Newspapers Archives, University of Oregon Libraries, 2013. Click image to enlarge Penny Postcard: Celilo Canal near The Dalles, Oregon, ca.1920. Penny Postcard, ca.1920, "Celilo Canal, near The Dalles, Oregon". A.M. Prentiss Photo. Published by Lipschuetz and Katz, Portland, Oregon. Card #401. In the private collection of Lyn Topinka. Click image to enlarge Penny Postcard: Upper Section of The Dalles-Celilo Locks, Oregon, ca.1920. Penny Postcard, ca.1920, "Upper Section of The Dalles-Celilo Locks, Oregon.". Published by Chas. S. Lipschuetz Company, Portland, Oregon, Card #200. In the private collection of Lyn Topinka. Caption on back reads: "Upper section of the New Dalles-Celilo Locks constructed by the U.S. Government making continuous navigation possible on the Columbia River for its entire course along the Northern Boundary of the State. On the right hand side by side is The State Portage Railway and the O.W.R.& N. Line. The North Bank Railroad Bridge in distance." Click image to enlarge Penny Postcard: The Dalles-Celilo Canal, ca.1920. Penny Postcard, ca.1920, "Celilo Falls, Upper End of Celilo Canal and Indian Village, B.C. Markham, The Dalles, Ore.". Card #95. In the private collection of Lyn Topinka. Click image to enlarge Penny Postcard: The Dalles-Celilo Canal with Cape Horn, ca.1920. Penny Postcard, ca.1920. Card #650. In the private collection of Lyn Topinka.